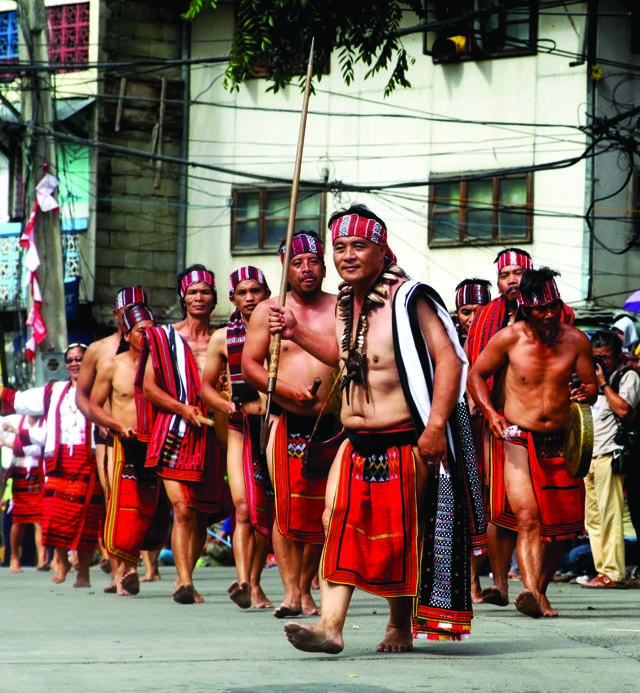 BONTOC, Mountain Province – Located in the Central Cordillera, northern Philippines, this province celebrated its Lang-ay festival where various indigenous groups showcased their rich culture in the street dancing, a culminating activity for the month-long festival. To the amazement of visitors and locals who were given the opportunity to understand deeper the cultural practices of each town, cultural presentations were focused on practices related to birth, marriage and thanksgiving, and indigenous practices on sustainable agriculture and forest preservation. The presentations were coupled with men in g-strings and women in wrap around skirts; material culture, like shields, centuries-old beads in necklaces or hair ornaments; chants, and dances, where body movements flowed to the rhythm of the sounds of the gongs and bamboo musical instruments, masterfully played by the men. For Lang-ay is not only the spirit of community sharing, echoed Congressman Max Dalog Sr. in the programs, but the preservation of the resources in order to support the lives of the people in the community and the generations to come. With the participation of the umili (villagers) from its 10 municipalities, this year’s celebration became educational. The final presentations were done at the Eyyeb grounds in the Poblacion of Bontoc. The I-Bontoks (the people of Bontoc town) relayed, in the street dancing and cultural presentations, the importance of environmental conservation with the aid of recycled materials used as props. And remembering the death of Macliing Dulag, who led the anti-Chico dam opposition, on April 24, 1980, they reiterated the defense of their ancestral land from destruction. In downstream or lagod of the Chico River, the I-Sadanga (people of Sadanga town) relayed their agricultural ritual of thanksgiving in their presentation. With bountiful rice harvest, their thanksgiving is coupled with animals, like a chicken they carried, to be offered in the rituals. Notable, too, was the participation of children, reiterating good practices must be transferred by the elders to their youth. In the upstream or aplai of the Chico River, the umili (villagers) of Bauko town presented their indigenous system of forest management, its importance in their life-support system, as they gather products there to compliment their agricultural products from their rice fields. The forests in their town form part of the reservation for the Chico River, where the water starts to flow down to Kalinga and joins the Cagayan River then on to the China Sea. Indigenous peoples in the province are keen on the life cycle, which was manifested by the Sabangan presentation dubbed “awil de e-Sabangan.” In the awil, community folk give gifts to the spouses, who were blessed by a newly-born baby. By the sounds of gongs, the participants carried in a basket of un-husked rice as gift for the spouses and their baby. Still upstream Chico, the Tadian town folk presentations were various dances performed in different community occasions, particularly during marriage and agricultural thanksgiving. They held their head up high as they played, including the takik, or courtship dance with the use of gongs and solibao or indigenous drum, and other dances to the rhythm produced from bamboo instruments. In the western and upstream part of Mountain Province are the towns of Sagada and Besao. The Sagada folk relayed, through cultural presentations, the various ritual practices that the elders use to determine the schedules to traditional community events, like weddings and agricultural activities in the dap-ay, an indigenous socio-political institution where they meet to decide. They relayed the role of the elders and community folk, particularly in the realizations of these rituals. It is the only town with a dap-ay as its float in the street dancing and presentation. In the nearby town of Besao, the folk presented their sustainable practices on agriculture. They were able to maintain the Japanese fish called kaling, where such species already disappeared in some rice fields in the province due to commercial inputs. Also, they reiterated the persistence of the practice due to the role of women, who shoulder most of the burden in rice field works. In the eastern towns of Barlig, Natonin and Paracelis peopled by the indigenous Balangao, their presentations revolved on indigenous cooperation and distinct practices. The people in these towns can expertly play the gongs in their eagle dance, though Barlig folk are still claimed to be the best players. The Barlig Balangao have abundant products from forests and rivers, which led to masterfully hone their skills in hunting wild games at Mount Amuyao. Among their material culture displayed in the festival was their unique hunters back pack, called locally as karupi, made from indigenous materials and which can’t be wet even during strong rains. The Balangao in Paracelis town, near Kalinga province, paraded a native rice granary where they usually build through ug-fhu or community cooperation after their busy field works. Complimenting their community unity are their necklace and bracelets made from centuries-old beads bartered from early Chinese trades by their ancestors and passed from one generation to another. Unfortunately, the Balangao of Natonin town failed to give a cultural presentation for this year’s Lang-ay’s street dancing. Governor Mayaen, in a press conference, pointed out that the people’s culture is very important as this is their identity as people. Though not comparable based on measurement in urban development, their systems had been proven to be sustainable, environment-friendly, and pro-people, he said.